Description: Sexes similar. Brownish-olive above; white below with bold streaks of dark spots; russet crown bordered by dark stripes; bold white eye ring; and pinkish legs. Lacks eye stripe. Behavior: Usually seen on the ground; walks, with tail cocked, rather than hops. 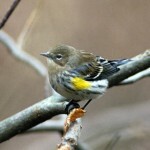 Habitat: Well-drained bottomland deciduous forests, and mature shady upland forests. 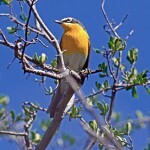 Where in Nebraska: Uncommon to common spring and fall migrant statewide. 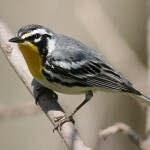 Locally common summer resident in Missouri’s forested valley, Niobrara Valley west to Cherry County, and Pine Ridge area. 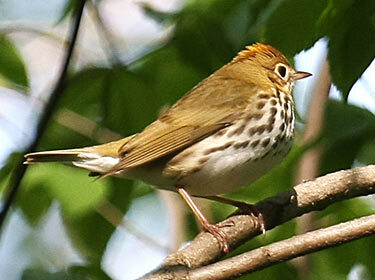 Fun Facts: The Ovenbird is named for the nest it builds, which is like a Dutch oven, enclosed in vegetation on top.